After enjoying hours and hours viewing all the beautiful collections from London Fashion Week which took place last month, I thought i'd keep you one step ahead and share with you my top 5 fabulous trends that will be big for next spring summer. From metallics to pastels, boyish tailoring to sports luxe, spring summer 14 has a more relaxed feel to silhouettes that are still wonderfully feminine and easy to wear. Have a look at my top 5 trends below with amazing high street pieces that are available right now! 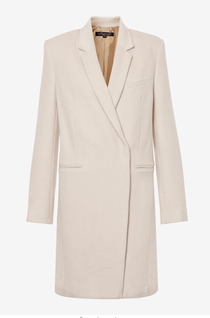 Tailored boyfriend coats in soft pastel hues are ultra sleek and sophisticated - a guaranteed staple piece for your wardrobe that combines a minimilistic style with a wonderfully chic colour palette. Stylish, sophisticated and super warm too! English garden florals are a strong trend for spring 14. 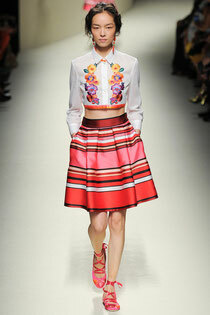 Painted flowers printed onto floaty dresses and crisp white shirts breathe new life into spring florals. 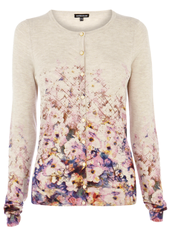 This ladylike cardigan is the perfect way to step into the next season with feminine charm. Wear with a 50's style skirt or over a dress for the perfect lunch date outfit. New shiny metallic fabrications were all over the runway at Fashion Week - great for occasion wear but also great worn casually to add interest and texture to your outfits. 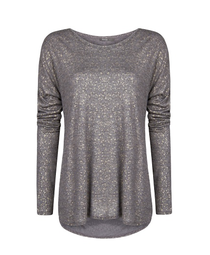 Add a little shimmer to your wardrobe with this simple top! Great for teaming with winter basics like a coat and jeans! There was a focus on silhouettes becoming more relaxed, in particular looser fitting tailored pieces matched with a more fitted garment on top/bottom giving a cool luxe feel. 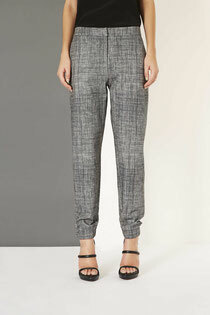 A smart fabric in the looser jogger shape - the perfect new silhouette trouser for work or weekends. Floaty layers of sheer lace are a more formal trend for spring 14, giving a romantic dream like feel to dresses. A palette of berries and greens bring a mysterious charm to the use of feminine lace for the new season. 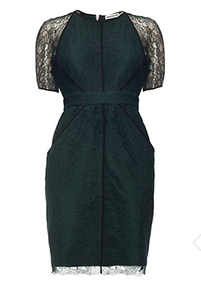 This gorgeous dress is a taste of the trend but still keeps areas covered in a flattering way. Wear with gold embellished accessories for a bolder evening look. 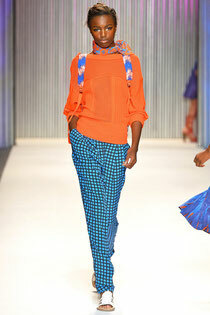 What do you think of the new spring summer 14 trends? Were you lucky enough to go to any of the LFW shows? I'd love to hear your comments.